Mother Goddess Shakti Worshiped at Saptashrungi Shaktipeeth (65 kilometers from Nashik in Maharashtra) is known as Adi Maya. It is another form of Mother Goddess Durga. 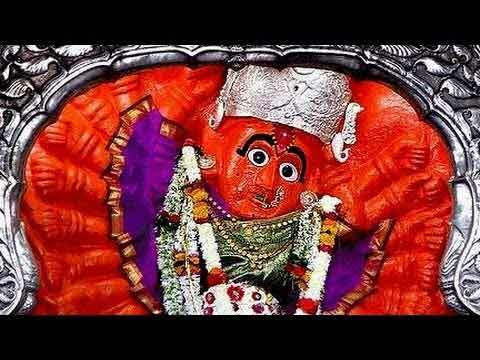 Saptashrungi Mata, this fierce form of Mother Goddess Shakti, is believed to have annihilated demon Mahishasura. The goddess worshipped at Saptashrungi Temple is also known as Brahma Swaroopini as she came out of the Kamandalu of Brahma. The Mother Goddess here is a combination of Goddess Mahakali, Mahalakshmi and Mahasaraswati. The murti, which was hidden for millions of years, was discovered by shepherd who went in search of honey. The murti of Goddess is seen in a niche carved in a rock. It is about 2.5 meters high with 18 arms. The arms hold various weapons given to Goddess Durga by various Gods – Vishnu’s discus, Shiva’s trident, Indra’s thunderbolt, Yama’s staff, noose of Varuna and so on. The murti is depicted as riding on a lion. A unique aspect of the murti of Mother Goddess is that it is slightly bent. Legend has it that once Sage Markandeya was giving a sermon nearby and Mother slightly tilted to listen to sermon of the Sage.